The Staffordshire County Pool Association recorded a hat-trick of wins in the National finals last week. Sending 5 sides to the finals, with ages ranging from 10 years old to 68 years old, the players went with high expectations. The under 23s made their first visit to Great Yarmouth and did themselves proud although losing in the quarter finals of both events. The Seniors were next up and came home with the championship for the second time in 3 years. Their first win came in the early hours of day 1 beating Greater Manchester 16-15 in a nail biting game that they were never in front. The following day it was Warwickshire and they disposed of by 15-7. Next up it was Surrey , in the Semi-final and the seniors eased through 15-8. To the final against a very strong Lincolnshire side. Having led 11-7 , to trail 12-11 the class of the side and strength in depth showed as they reeled the next 4 frames to capture the Inter County National title 15-12. The Staffs A side suffered a early defeat but followed this up by winning the County Cup competition, by beating Northants A 23-18, Gloucestershire 23-11 , Humberside 23- 17 and in the Final 23-15 over Cornwall . The B side after 3 consecutive titles suffered a first round defeat to eventual champions, Leicestershire , but there was no stopping them in the County cup as they beat Cleveland 23-12, Essex 23-17 , Surrey also 23 -17 and in the Final they saw off Regional rivals West Midlands by 23-19, to lift the 3rd title for Staffordshire. The Juniors are gaining valuable experience and they edged out Cornwall 23-19 before suffering a 23-21 defeat at the hands of Essex juniors. In the County Cup they once again fell in a tight 23-20 defeat to Nottinghamshire. 3 titles out of the 5 on offer shows Staffordshire to be the county to beat. We also had the Ladies finishing a commendable 'runners-up' in the Ladies KO and two semi-final appearance for for the Mens A and Juniors. First off, I would just like to say thank you to everyone who attended this weekend and for the support shown by those who could not. Thanks to the weatherman the usual agenda went up in smoke resulting in England Trials being rearranged for various dates across the calendar and congratulations are in order, as once again Staffordshire have representatives for the national teams. Congratulations to Zac Cooper, Leanne Cragg and Jodie Lockett who are now ENGLAND INTERNATIONALS for the Under 23’s and Ladies outfits after a successful qualifying campaign. The action in the main event kicked off (as usual) on Thursday night with the Seniors competition, with our SENIOR B team looking to retain the title! Not at full strength due to the change in dates, it just wasn’t meant to be, as our team were well beaten 13-5 by Berkshire, sending them into the KO Cup. Here they got off to a good start against Hertfordshire, taking a lead of 11-6 in a race to 13. However, Hertfordshire then took the next 6 to take the advantage 12-11. Stu Jones and Chris Bowers kept their cool to book Staffs a place into the quarter finals. Up next was Lincoln, and it’s safe to say Staffs were left to rue missed chances and took an early bath. Eventually losing 13-9. TAXI!!!! NEW DAY – NEW STAFFS While the Seniors were on their way back down the A14, the MENS B section got under way. With our side coming up against neighbours, Cheshire. There may not be many miles between the 2 county outfits but the difference in class was evident from the start after racing into a 9-2 first session lead, Staffs took the match an impressive 23-8, and in doing so sending a clear message to the other counties. Onto Saturday and the MENS A, LADIES and JUNIORS continued the trend by winning all their matches, the A side with a comfortable 23 - 12 over Gloucester, Ladies 23 - 19 over Leicester and Juniors with a 23 - 20 win over Bristol, with only 10 players! All teams safely through to the Quarter Finals. This is where 2 of our sides went out of the main event and into their respective KO Cup sections, the Ladies put up a good fight against South Yorkshire eventually losing 23-20. The Juniors were well beaten 23-8 at the hands of Kent. In their KO Cup quarter-final matches both teams won to send them through to the Sunday. Ladies stepped it up and sent West Yorkshire home after a 23-13 win, Juniors winning on a play off 24-22 against Norfolk, again with only 10 players! The MENS A and B sides looked to be in cruise control as they both sailed through to the Sunday, the B side once again showing their strength in depth by winning 13 frames unanswered to wrap up Warwickshire 23-8. The A side equally impressive as they made light work of Hertfordshire, 23-12. Now I expected our LADIES team to collect some silverware this year and they didn’t disappoint! Running out 23-15 winners over Essex to book their place in the KO Cup Final! In the MENS, the A, like the Seniors, were left to rue missed opportunities and were sent out at the hands of eventual winners Berkshire 23-17. The B side looked impervious as they took apart Cleveland 23-11, to send them into a 3rd successive final. LADIES KO CUP FINAL Now to say our ladies team were underdogs going into this final, is a massive understatement. They were up against a Kent side capable of winning the main event, only finding themselves in the KO Cup after losing in a play-off with eventual winners Lancashire. With the England Ladies captain and 2 other England players in their ranks, their class showed as they ran out 23-10 winners to take the Cup. Our Ladies team are certainly getting better every year and I personally believe they are among the top 4 nationally, massive congratulations LADIES – INTER COUNTY KO CUP RUNNERS UP! STAFFS B VS WEST YORKSHIRE B Going into this final our MENS B side had only dropped 27 frames throughout the weekend and only broke into the 4th session during the semi-finals. Whilst Yorkshire had been pushed into the deep end on all 3 of their outings. Had Staffs peaked too soon? Had Yorkshire been hardened by their “tough” road to the final? Finals are always cagey affairs and this was no different. Staffs took the first 2 sessions 6-5 before Yorkshire hit back with a 6-5 win of their own in the 3rd. The match was poised at 17-16 to Staffs. Yorkshire took 2 of the next 3 to leave the match in the balance at 18’s. Although by the looks of the 2 teams you would assume that Yorkshire would be more experienced in such situations, it was the Staffs who showed their experience and nerve to take the next 4 frames and leave our side on the verge of victory. West Yorkshire pulled one back, usually the player that pots the winning black gets picked up off the floor however, Steve Dawe sank the winning black to hand Staffs the title of NATIONAL COUNTY CHAMPIONS!!! for the 3rd year in a row. Can they break the record next year? WELL PLAYED EVERYONE! UNTIL NEXT YEAR………………..
Its all go on the County scene with the trials completed and Interleague entries all sorted. The opening Interleague fixture is Friday February 9th followed on the Sunday (11th) by the opening county fixture. These are soon followed by the National County Finals and England trials at Great Yarmouth commencing Feruary 28th through to March 4th. The county have set the date for the 2018 AGM .All proposals for next year should be in the hands of the secretary by Sunday October 15th or via your league secretary. News from a recent EPA National meeting came that we will be setting up a Under 23 side, aimed away from the junior set up , 19 years old plus. The county will be looking to recruit a team manager for this side or perhaps a player/manager. Please speak to a SCPA committee member if you're interested in playing. Also from that same meeting came news of the Senior set up changes. The seniors from 2018 will become a 7 man team, playing four sessions, 28 frames in total. A massive congratulations and job well done to Stu Jones and Alex Bailey who are now ENGLAND INTERNATIONALS for the Seniors and Men’s outfits after a successful qualifying campaign. All the action kicked off on Thursday with the Seniors competition, and what a way to start off the weekend.....the 'experienced' staffs team brushed off tornament favourites West Yorkshire,who boasted 3 current England internationals, 13 - 6 after being level at 5 each at the half way stage. Friday morning came with the Seniors second match, where they demolished Norfolk 13 - 4 to avoid the KO Cup. Into the semis and a tasty clash with region 3 rivals West Mids A, after taking a 4 - 1 lead in the first session West Mids pulled our guys back to 5 all. Staffs took the next 2 sessions 3 - 2 leaving them 11 - 9 in front. Chris Bowers made it 12 setting up Paul Ward to take the Seniors into the final with Essex. This was a tight affair which ebbed and flowed all the way to the end, our 'legends' didn't disappoint though, despite trailling 10-6 at one stage , they came through in true Staffs spirit to win 13-11 and the title of NATIONAL COUNTY CHAMPIONS 2017!!! While the Seniors were collecting their spoils the MENS B section got under way. Our side met a spirited Gloucester who kept up the pace with the score poised at 17 - 16 to Staffs. The B side did their usually trick and took 6 out of the next 8 frames to close out the match 23 - 18. Onto Saturday and the MENS A, LADIES and JUNIORS continued the trend by winning all their matches, the A side 23 - 15 over Somerset, Ladies 23 - 18 over West Yorkshire and Juniors with a 23 - 15 win over Suffolk. All teams safely through to the Quarter Finals. This is where we lost our first team of the weekend with the Juniors going into the KO Cup after a 23 - 15 defeat at the hands of a good London side. They next had to face Warwickshire in a match that finished around 10pm, with the score tied at 22, Staffs went into a 3 frame play off. Brad Peach's finish was cancelled out, leaving the score at 23 each, Ryan Dimarco was the unluckiest person in the room after knocking in a brilliant ball only to watch the white cut the opponents yellow in from nowhere! Warwickshire took the match and eventually the KO Cup title. Region 3 rivals West Mids met us in the A section with Staffs running out 23 - 17 winners, the B section saw Staffs overcome Essex 23 - 19, the Ladies are no longer welcome in Yorkshire after knocking out South Yorkshire 23 - 17. Sunday and the Semi Finals and we lost our second team of the weekend with the Ladies coming up against eventual winners Lancashire. After losing the first session 7 - 4 our Ladies battled back to level the score at 11 all. The third session did the damage as Lancashire won it 8 - 3 and eventually the match 23 - 18. In the MENS semi-finals it was an all Staffordshire v Berkshire showdown. Our B side took out the first session 9 - 2 in their match and never looked back, eventually running out 23 - 18. Could the A join the B in reaching the final? Berkshire had knocked out our A side the last 2 years running and it looked as though that trend would continue as after 2 sessions Staffs were down 13 - 9. However in the third session our A side showed exactly what they are capable of, taking it 9 - 2 and knocking the belief out of Berkshire along with it, Staffs assured their place in the final, running out 23 - 17, banana skin disposed! In the A final our team got off to a fantastic start and were leading 12 - 10 at the half way point. It was in the third session once again where the game changed! With the run of the balls fully against Staffs, they managed to stay in touch at 17 - 16 down going into the fourth session. The balls however did not change in favour of our lads and Lancashire knocked in clearance after clearance and took the match 23 - 17. 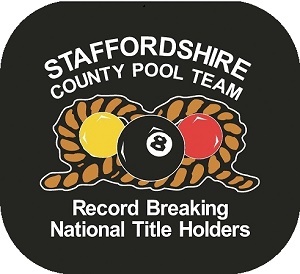 NATIONAL COUNTY RUNNERS UP – STAFFORDSHIRE MENS A. 2017 NATIONAL COUNTY CHAMPIONS !!! Many Thanks to Nick Wilshaw, B team captain for the report. Ladies, Seniors and Juniors Sunday 8th January. All will be taking place at Players 12noon start. The trials for the 2017 county Seniors will be held on Sunday January 8th at Players. All players must register at 12 noon for a 12 15 start. 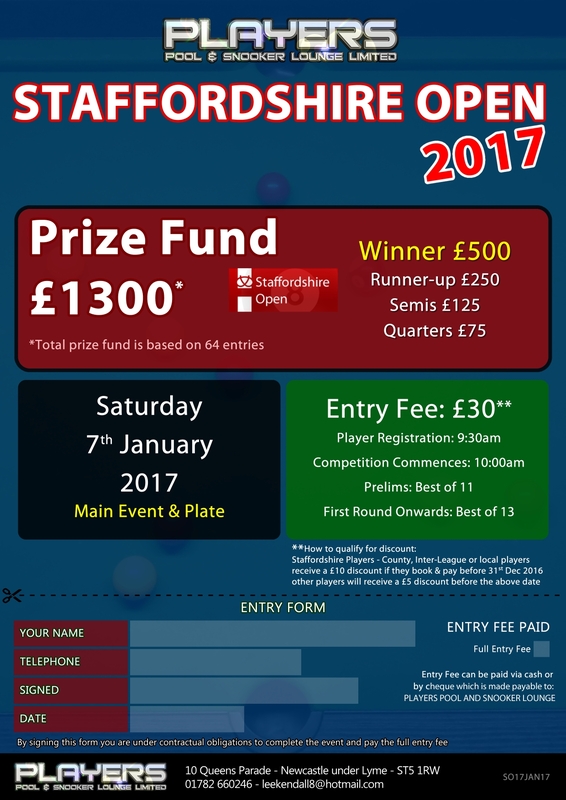 The 2017 Staffs Open at Players Pool Club this year goes ahead on Saturday 7th January ...All details, including how to get a discount on your entry fee ...are on the poster below ..
Five person team, four players play in each match with one named reserve. play a one frame scotch doubles decider. The 96 winning teams from above to play in 32 Groups of 3 at 3-00pm. All players in the teams who are eliminated in the 9-00am and 12-00 noon sessions,may enter the Singles competition which will commence on the remaining 24 Tables, at 3-00pm and will play through to the last 32 to go forward to Sunday. The 2017 SCPA AGM is to be held on Sunday November 27th at Longton Snooker with a 6pm Start. All interleague sides are requested to pick their bond money up. Positions open for re-election are Secretary , Mens Team Manager, Junior Team Manager and Senior Team Manager. All Proposals for rule changes etc and people applying for the positions stated above Must be In for Sunday October 16th in writing to the secretary. The new look website has been launched with a bit less links and more tied into the EPA site , no use doubling the workload. As you can see, we have a new look badge for our county sides and obviously a new fresh look for their county shirts. The county will also be introducing ,in line with the EPA a new county championship for all four sections, Men, Ladies, Juniors and Seniors. The champion in each event will get free entry into the national finals against other counties.